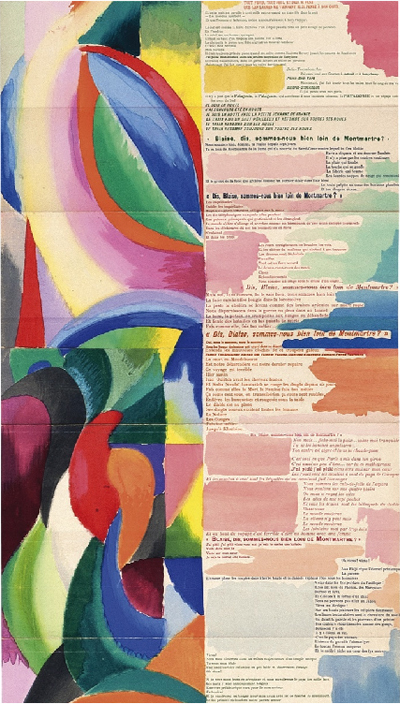 CENDRARS, Blaise & DELAUNAY, Sonia. La Prose du Transsibérian et de la Petite Jehanne de France. Paris: Editions des Hommes Nouveaux, 1913. 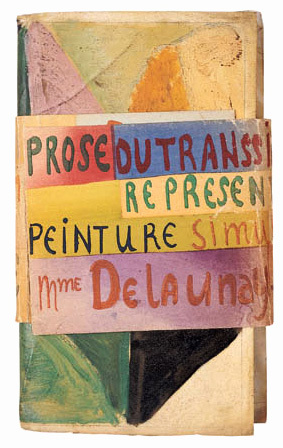 Box (above) by Paul Bonet after Sonia Delaunay. Est. at 40,000 - 60,000 EUR ($53,173 - $79, 972). Sold for 312,750 EUR ($415,937, incl. premium). Four twentieth century illustrated books, in astonishing bindings, out of a total of 190 lots, sold for over $100,000 each at Sotheby's - Paris in their Livres Illustrés de la Biblioitheque R. & B.L. sale, March 28, 2012. A fine, first edition copy of Blaise Cendrars' collaboration with artist Sonia Delaunay, La Prose du Transsibérian et de la Petite Jehanne de France, in a chemise and box by Paul Bonet, brought the highest price. It was estimated to sell for $53,173 - $79, 972 (40,000 - 60,000 EUR). It fell under the hammer at $415,937 (312,750 EUR, incl. premium). Called "one of the most beautiful books ever created" when Yale University Press reissued it in 2008, and a milestone in the evolution of artists' books by Joanna Drucker in The Century of Artists' Books (p. 50), it is "a sad poem printed on sunlight," according to Cendrars, who published it under his New Man Editions imprint. Comprised of four sheets glued together to form an accordion (fold-out) binding 199 centimeters tall when opened, only sixty copies out of a planned 150 were issued, and of those sixty only thirty are believed to have survived. BONNARD, Pierre. VERLAINE, Paul. Parallélement. EST. 30,000 - 40,000 EUR ($39,901 - $53,173). Sold: 78,750 EUR (($104,673, incl. buyer's premium). 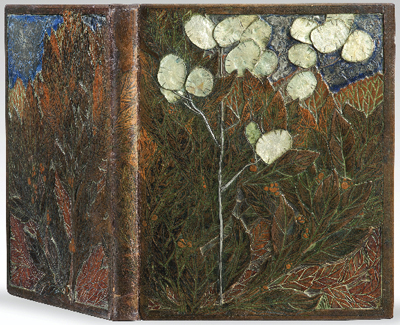 A copy of Paul Verlaine's Parallélement, illustrated by Pierre Bonnard, and in an stunning binding by E.-A. Séguy, was estimated at $39,875 - $53,173. It fell under the hammer at $104,673 (incl. buyer's premium). It was issued in an edition of 200 copies featuring 190 lithographs by Bonnard. Of the twelve copies, in original wrappers or rebound, that have come to auction since 2000, the highest hammer price was $44,500 at Sotheby's June 11, 2002 for a copy bound by J. Anthoine Legrain. The scarce binding by the great Séguy accounts for the $60,000 difference. 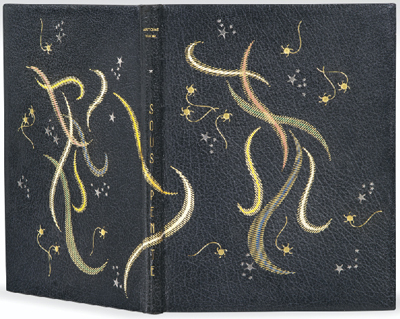 Decorator and designer, Eugène-Alain Séguy (1890 - 1985), produced only a few bindings during his career. 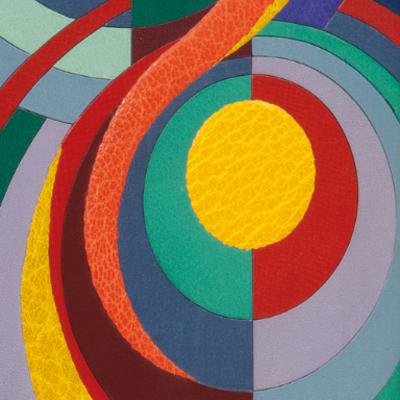 He is best known for his work in the graphic arts and textile design, including folios of Art Nouveau and Art Deco-inspired design models in lush pochoir that he published 1910 - 1930. TEMPLE, Guillaume. ERNST, Max. Maximiliana. ou L'Exercise Illégal de L'Astronomie. Paris: Le Degré Quarante-et-un, 1964. Est. 50,000 - 70,000 EUR ($66,501 - $93,104). One of seventy copies on Japon Ancien paper, each signed by the artist and editor, Maximiliana, Max Ernst's collaboration with Guillaume Temple, is graced with thirty-four watercolors by the Dada pioneer. This copy, in a binding by P.-L. Martin, contained an extra, unpublished watercolor by Ernst. Estimated at $66,501 - $93,104 it fell under the hammer at $112,733 (incl. premium). DALI, Salvadore. LAUTREAMONT, Comte de. 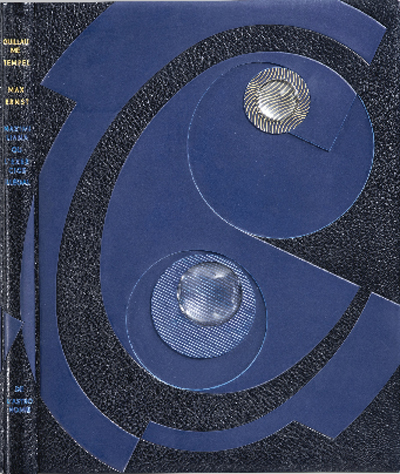 Binding by George Leroux (1993). Est. 40,000 - 60,000 EUR ($53,173 - $79, 972). Sold 78,750 EUR ($104,673, incl. buyer's premium). Salvadore Dali's illustrations to Le Comte de Lautréamont's Les Chants de Maldoror are considered to be his best book work. Issued in a total edition of 200 copies on vélin Arches, this copy, in a masterful, 1993 binding by Georges Leroux, is one of forty signed by Dali and containing an extra-suite of illustrations. Estimated to sell for $53,173 - $79,972, it realized $104,673 (incl. premium). 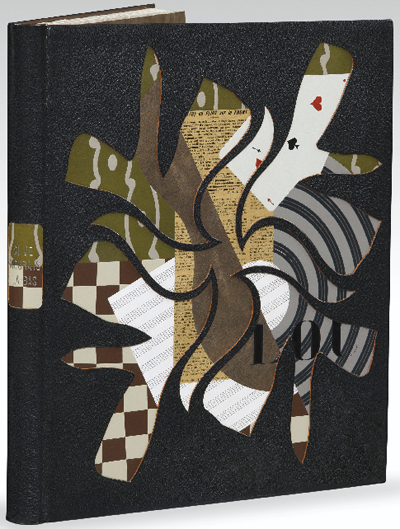 Binding by George Leroux after Braque. Sold 60,750 EUR ($80,812, incl. premium). Many of the remaining lots realized five figure prices, not the least of which was a copy of the Georges Braque-illustrated edition of Apollonaire's Si Je Mourais La-Bas?, its eighteen colored woodcuts considered to be Braque's most important book illustrations. 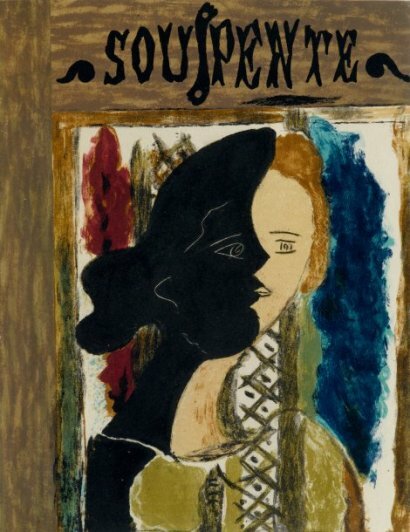 Issued in a total edition of 180 copies, the copy above, bound by Georges Leroux after Braque motifs, is one of forty with an extra suite of color woodcuts, each signed by Braque. Estimated at $53,173 - $79,972, it sold for $80,812 (incl. premium). [BRAQUE, Georges]. TUDAL, Antoine. Souspente. 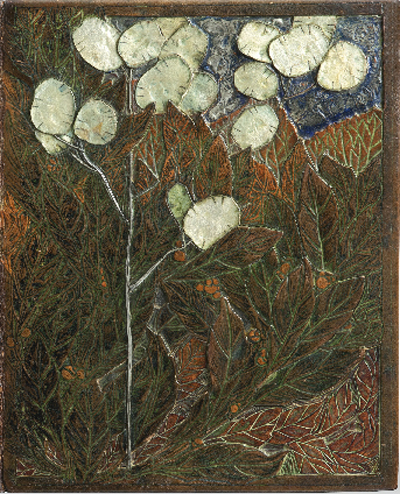 Avec Une Lithographie en huit Couleurs de Georges Braque. Est. 2,500 - 3000 EUR ($3,325 - $3,990). Even the stragglers - those modern illustrated books that sold below $10,000 - were impressive. Braque's contribution to Antoine Tudal's Souspente is a lithograph in eight colors that is considered Braque's best such. This copy is one of an edition of 125. 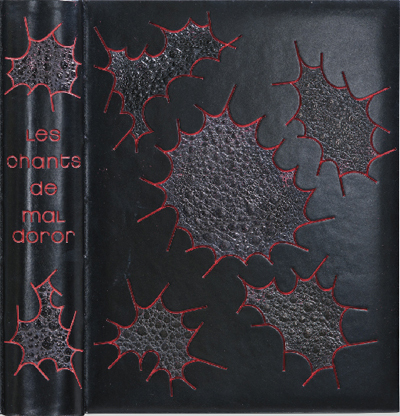 Not much is known about the binder, Thérèse Moncey, beyond that she worked in Paris 1945-1965, and won a grand prize of French binding in 1950. Estimated to sell for $3,325 - $3,990, it sold for $6.650 (incl. premium).